APPEARANCE: Imori are the ghosts of dead warriors transformed into geckos. They haunt the forgotten, overgrown ruins where they lost their lives, attacking and harassing trespassers. 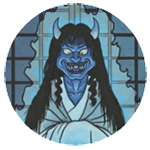 This yokai’s name is somewhat confusing — it is written with the kanji for gecko, which is normally pronounced yamori; yet in this case the name is pronounced imori, which means newt. When written it implies that this is a gecko yokai, but when spoken it sounds like a newt yokai — and in actuality it refers to a gecko yokai. LEGEND: Long ago, in Echizen province, lived a monk named Jingai Shuso. He was a monk of the Soto school, and was living in hermitage out in the mountains. He lived off of wild mountain plants and whatever charity the people from the local village would bring him, although he spent almost all of him time in secluded meditation. One day was reading in his hermitage near the ruins of Yu-no-o castle when suddenly a small man (about 5 or 6 inches tall) wearing a black hat and carrying a cane appeared and started talking to him. Being a good monk, Jingai did not let the stranger interrupt his studies, and just continued reading. This angered the man, who complained that the monk was ignoring him even though he was standing right there. Again, Jingai ignored the tiny man, who then became very angry. He hopped up on to his cane and flew at Jingai, who brushed him away with his fan. The tiny man fell to the ground and swore revenge on Jindai. Shortly afterwards, 5 women about 5 or 6 inches tall came up to Jingai and complained about how he treated the old man. While they complained, all around them appeared 10,000 more tiny people, with sleeves rolled up and armed with canes. They swarmed upon Jingai and beat him with their canes. It was like an army of tiny, painful ants attacking him. In the distance, he could see their general: a tiny man decked in red and a lacquered samurai helmet. The tiny general called out: “Get out of here and never return, or else we will pop your eyes and slice off your ears and nose!” By now, some tiny men had climbed upon his shoulders, and they began to eat his ears and nose. Jingai brushed them off and ran away. The monk ran away from the horde to a nearby gatehouse. When he arrived there, there were already thousands of tiny men all over, who knocked him down. The general said to him: “We heard you were rude to our friends. As a punishment, we will cut off your hands and feet!” Thousands of tiny katanas were drawn from their tiny sheathes, and Jingai was surrounded. Jingai, now terrified, apologized to the little men for not considering their feelings, and asked them to spare him. The general told him that if he was truly sorry, he would let him go, and ordered his men to eject Jingai from the gatehouse. Jingai got the heck out of there. The next day, reflecting on what had happened, Jingai investigated the direction he came from. He discovered a large hole in the ground that was swarming with geckos. Gathering some local villagers for help, he dug up the hole. It was over 3 meters deep, and full over over 20,000 geckos! Deep inside, he discovered a 12 inch long gecko, which he realized must have been the general. The eldest villagers explained to Jingai that long ago an ally of Nitta Yoshisada built a castle near there, and it was destroyed in a battle. 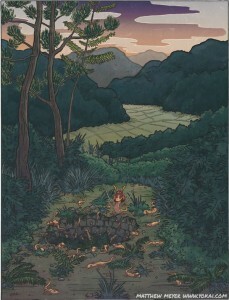 The the souls of the dead bushi (warriors) and the castle lord haunted the remains of the old castle well. Ever since, they had been causing all kinds of mischief in the area. Jingai began chanting sutras to give the souls a proper burial, and as he finished chanting, the thousands of geckos were all destroyed. Jingai and the villagers took pity upon the dead beasts. 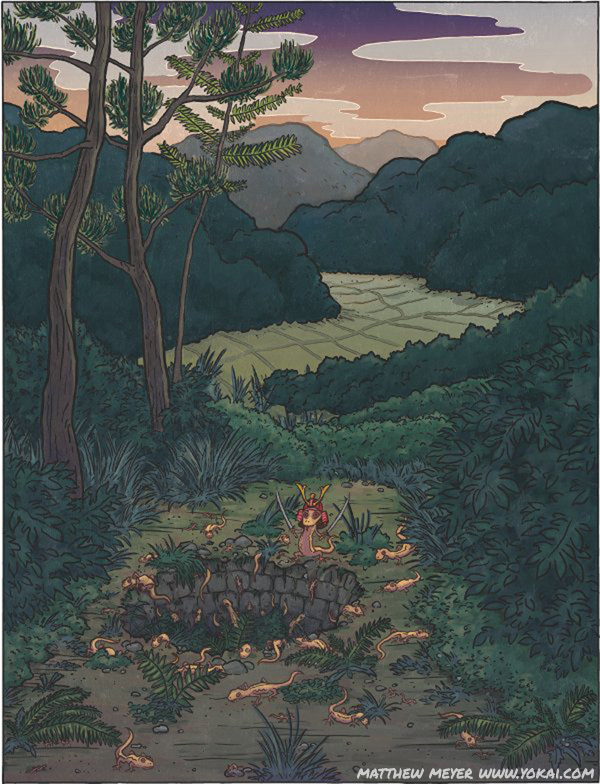 They collected the bodies and burnt them on a funeral pyre, giving them a proper burial, and with the mountain of ashes built a grave for the imori.